Gently activate, stimulate and release your face muscle and bone for a relaxed and bright new look. 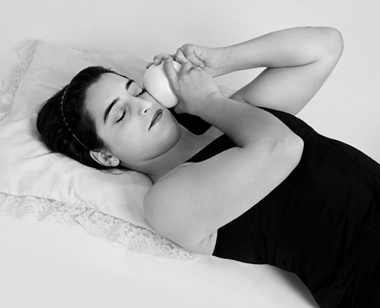 Save your Face, TMJ and Sinuses will be the next Yamuna® Face-Fitness class to be held on Sunday, March 19 at the Belfast Yoga Studio starting at 2:00 p.m. In this three-hour hands-on class, you will evoke your spring face by learning to stimulate bones, muscle and skin, thereby keeping your face more vibrant and beautiful. Learning how to work your own face with specially designed Yamuna® Face balls will give you a way to prevent aging and when you feel the difference in your face when it is relaxed versus your normal, you will want to incorporate this work into your self-care program. Our faces are subject to tremendous repetitive stress from very early on. We begin to frown, squint our eyes, clench our jaws, grind our teeth, tighten our lips and on and on. Each of us has tension patterns that we are no longer aware of that we do constantly, every day all day.These patterns and repetitive stress and tension cause early bone loss, form wrinkles, cause sinus and tension headaches, TMJ and a myriad of other challenges for our irreplaceable faces. People often grind down their teeth and their jaw and cause significant bone damage, and create constant headaches and neck pain. Lots of money is being spent on dental appliances, injections, and periodontists. That is because your tempo-mandibular joint (TMJ) is where the clenching, grinding, and clamping down of the jaw during sleep causes all kinds of problems in the rest of the body.The TMJ is a master joint in the body and it regulates general tension levels in all the other joints of the body, especially the hip and shoulder joints. This class will focus on simple things you can do to break these tension patterns yourself. There are specific muscles that are easy to find and for you to work yourself. Once you break the tension patterns, your body does not want to keep them. Learn very specific things to stop clenching and grinding, learn how to take the impact out of your teeth, gums, and jaw, learn how to work all the related muscles in your face, skull, neck and jaw so that you can finally fix this problem yourself. The more you directly stimulate the facial bones, you prevent bone loss, keep the bones aligned and lifted, and keep all the facial & neck muscles function at their best. Lose your repetitive stress patterns in your face, take the tension out, and improve your skin glow and muscle tone with the Yamuna® Face-fitness education. Allergy sufferers often find by doing the face work regularly their chronic sinus issues are gone as the balls opens the sinuses and they suffer much less during allergy season by stimulating the facial muscles and keeping their sinuses cleared of congestion inflammation and irritation. If you already have the Face Ball Kit each class fee is only $45 prepaid or $50 at the door. If you do not have your own personal Face Ball Kit you must purchase one to participate. Marianna offers the regular Yamuna® Face Ball Kit as well as the discounted version; call Marianne at 207-338-3930 to reserve yours. You may pay with your credit card online on the “Event & Workshop” page on our website at www.belfastyoga.com. Space is very limited and preregistration is required even if you pay at the door. The Belfast Yoga Studio is located in Suite 302 at 9 Field Street, Belfast, in the large red and white Belfast Center. For complete information on all sessions and to register, go towww.belfastyoga.com or call 338-3930.